The relationship between migration and development is becoming an important field of study, yet the fundamentals – analytical tools, conceptual framework, political stance – are not being called into question or dialogue. This volume provides a valuable alternative perspective to the current literature as the contributors explore the contradictory discourses about migration and the role these discourses play in perpetuating inequality and a global regime of militarized surveillance. The assumptions surrounding the assymetrical transfers of resources that accompany migration are deeply skewed and continue to reflect the interests of the most powerful states and the institutions that serve their interests. Those who seek to address the morass of development failure, vitriolic attacks on immigrants, or sanguine views about migrant agency are challenged by this volume to put aside their methodological nationalism and pursue alternative pathways out of the quagmire of poverty, violence, and fear that is enveloping the globe. Nina Glick Schiller is Director of the Research Institute for Cosmopolitan Cultures and Professor of Social Anthropology at the University of Manchester and the founding editor of the journal Identities: Global Studies in Culture and Power. 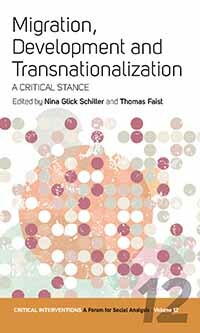 Thomas Faist is Professor of Transnational and Development Studies in the Department of Sociology, Bielefeld University. He serves on the editorial board of The Sociological Quarterly, Ethnic and Racial Studies, Migration Letters, and South Asian Diaspora.